Malcolm Little changes surname to "X"
In 1952, after his release from prison, Little visited Elijah Muhammad in Chicago, Illinois. Then, like many members of the Nation of Islam, he changed his surname to "X". In his autobiography, Malcolm X explained the "X": "The Muslim's 'X' symbolized the true African family name that he never could know. For me, my 'X' replaced the white slavemaster name of 'Little' which some blue-eyed devil named Little had imposed upon my paternal forebears." The FBI opened a file on Malcolm X in March 1953 after hearing from an informant that Malcolm X described himself as a Communist. Soon the FBI turned its attention from concerns about possible Communist Party association to Malcolm X's rapid ascent in the Nation of Islam. In June 1953, Malcolm X was named assistant minister of the Nation of Islam's Temple Number One in Detroit. By late 1953, he established Boston's Temple Number Eleven. In March 1954, Malcolm X expanded Temple Number Twelve in Philadelphia, Pennsylvania. Two months later he was selected to lead the Nation of Islam's Temple Number Seven in Harlem. He rapidly expanded its membership. After a 1959 television broadcast in New York City about the Nation of Islam, The Hate That Hate Produced, Malcolm X became known to a much wider audience. Representatives of the print media, radio, and television frequently asked him for comments on issues. He was also sought as a spokesman by reporters from other countries. From his adoption of the Nation of Islam in 1952 until he left the organization in 1964, Malcolm X promoted the Nation's teachings. He taught that black people were the original people of the world, and that white people were a race of devils. In his speeches, Malcolm X said that black people were superior to white people, and that the demise of the white race was imminent. Malcolm was jailed in Charlestown State Prison, a dull building from 1805. While he was in there, his brothers and sisters, especially Philbert and Reginald discovered theworld of Islam, preached byElijah Muhammad. They brought their new knowledge to Malcolm, who, at first, strongly disagreed with the new religion, but after a timeconverted.In prison he had lots of time, so he read some of the holy writtings and also wrote every day a letter to Mr. Muhammad. After Malcolm was paroled in 1952, hestarted to preach in the buildings of Muhammad's Islamic church, and soon becamefamous for his open-minded, direct speecheswhich often were misunderstood as offense against the whites. 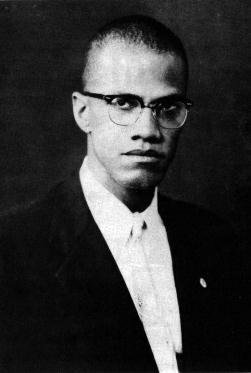 Malcolm helped theBlack Muslim Movement to establish in New York, Los Angeles and Detroit and soon was seen as a threat by the white population. Under the influence of Elijah Muhammad he also changed his surname from Little to "X". In 1958 Malcolm met and soon married another member of the Black Muslim Movement, Betty X. Even after the dismiss of his brother Reginald he stayed with the teachings of Muhammad. Malcolm Little changed his surname to X because the 'X' is meant to symbolise the rejection of 'slave names' and the absence of an inherited African name to take its place. The 'X' is also the brand that many enslaved Africans received on their upper arm.